I wound up selling this Mk II and others (mistake) when the Mk III made its debute. Recently I got an opportunity to revisit and photograph this old thing for a project I'm involved in and thought I'd share a picture or two and a tiny bit of this pistol's "history". This one has not kept good company. It "visited" with two armed robbers, one bank robber and more meth and crack dealers than I can honestly remember, but it never had a "conversation" with any of them; it never needed to; they complied with police orders and never threatened me. 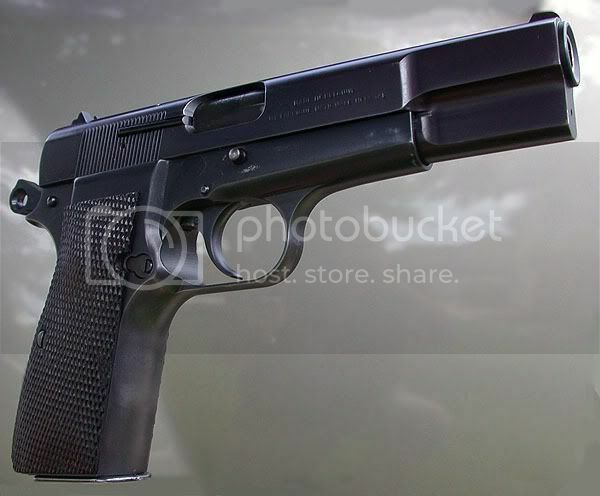 Stephen, it looks from the pictures like the size and carry weight of this gun, fully loaded, would be similar to that of a steel framed 1911. Is that about right? Hello. It weighs 32 oz. empty or very close depending on grips. How much it weighs fully-loaded would depend upon the particular load. Fourteen 124-gr. factory Remington 9mm cartridges weigh right at 6 oz. so that would bring the loaded (13 +1) weight to about 38 oz. An empty 1911-pattern pistol weighs about 39 oz, so the Hi Power weighs a bit less loaded with 124-gr. ammo than an empty 5" 1911 style pistol. On another forum, you once mentioned that when burglar (I think) you were hunting suddenly stepped out in front of you, you discovered a Hi Power would fit in a burglar's mouth right up to the ejection port. Is this that Hi Power? Well a pistol like that is certainly tempting. I like the classic lines of it. Are they particularly fragile or finicky, or do they just soldier along without hiccups? Man I cannot stop laughing! while not as durable as a 9mm 1911, they will last for a long time if not abused (say with thousands of rounds of SMG ammo like the SAS has been known to do in the past). As for finicky, I've found mine to be extremely reliable; I used to shoot IPSC (USPSA) with one. I'm a big fan of the hipower (in case you couldn't tell). I sold my G26 when I realized the hipower was actually easier to conceal with its narrower, round slide. My Hi power is rock solid reliable and should pretty much last forever. Occasionally someone has a problem, but I have never heard anyone complain about them being "finicky" like people do about 1911s. The HP was designed to be a military weapon and use FMJ ammo. Older model Hi Powers (and there are still a lot of those around) had a "humped" feed ramp that works great with FMJ, but sometimes not so well with hollowpoints. FN redesigned the feed ramp in the 1980s I think with the Mark II version, and all modern ones work just fine with FMJ. With a skilled touch the older humped feed ramps can be lightly flattened a bit to work with hollowpoint ammo if you want a shooter instead of a historical piece.